Here is a link to my resume, so you can get an idea of who I am without me taking a lot of words to try to explain that here. www.hosanna1.com/myresume.html . I am also including links to photos, as they are worth 1000 words. I am an early retired grandma, with no record of crime nor any other 'issues'. I now raise show dogs www.hosanna1.com/Hounds/ , and travel about 40,000 miles/year all over the USA with my dog show van www.aalf.ws/Liberty-Van/ . 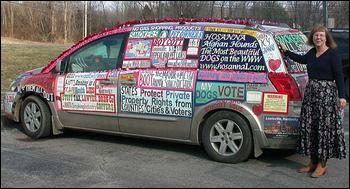 Since December, 2005, I have been 'creatively expressing my First Amendment Rights' with this van. It started with the 'we can't say Merry Christmas' thing. I painted MERRY CHRISTMAS across both side windows, and put Christmas Trees on both sides. Since then, I added greatly to the art work, and have been a total of about 70,000 miles all over the USA, except for the far north west. This van has been parked in front of every Statehouse from KY to Maine, KY to Sacramento, and KY to Florida since then, and several times in front of the Capitol building in Washington DC. So far, I have won in court four of four tickets for 'obstructed rear windshield'. Note, there is no such thing as a 'rear windshield' <G>. I was coming through St. Louis on 9/11/07, and had encountered anti-war protesters there before, so I stopped in a park, and redid the back window as a tribute for our troops & the 9/11 anniversary. I toured KY, Iowa, WI, IL, IN, MO, TN, GA, AL, and other states with this, and many soldiers, and their wives stopped me to thank me for it. One lady who aproached me at a rest area in GA told me her husband had just left for Iraq the day before. We pledged to pray for each other, and I told her I think those who protest and give public comfort to our enemies are guilty of treason. She agreed. I decided to leave this display on the van for one more trip to Washington DC, though I was getting ready to replace it. I was in Washington DC on October 4-5 for a Defending the American Dream Sumit, which was hosted by Americans for Prosperity. While trying to find the Eisenhower Admin. building for a scheduled press conference, I made the mistake of stopping to ask directions of a police officer. 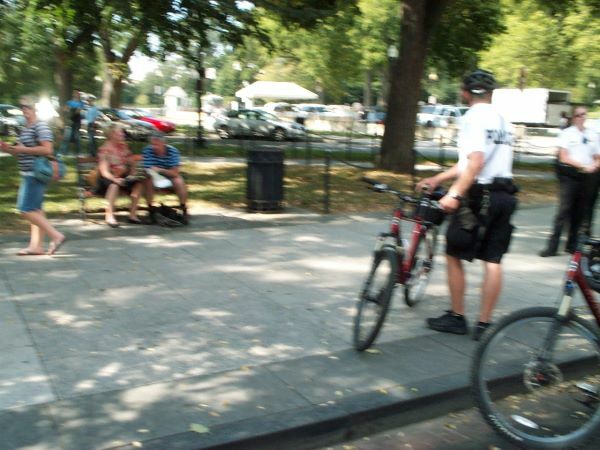 Next thing I knew, a whole swarm of bicycle cops decended. They started asking me all sorts of questions, and none was giving me the directions I was asking for. One of them demanded all my papers - license, registratnon, insurance, etc, which I had all in order, and handed over. He informed me he was 'stopping me' (I was already stopped???) for having an obstructed rear windshield. Note, there isn't much on my windshield, except for an oil change sticker, and also a police association decal. There is NO SUCH THING as a 'rear windshield'! I told him (politely) that I'd won four of those already. He wrote me two tickets anyway - one for 'Front, Rear, or side obstructed', and another for 'object hanging so as to obstruct'. 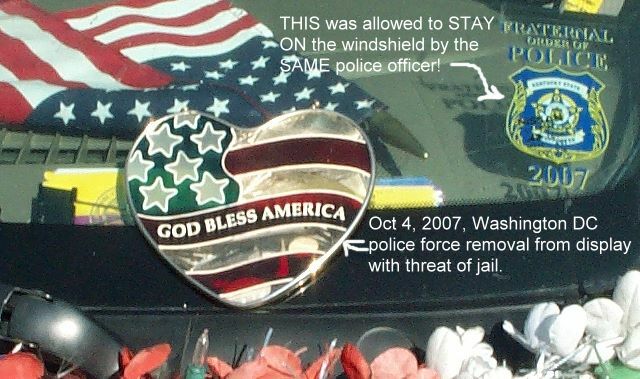 I had a 'God Bless America' sun catcher hanging from my rear veiw mirror (USELESS, due to covering rear window, also van was LOADED to the CEILING at this time). No big deal, for me a ticket is an invitation to park this van in front of another courthouse, hand out lots of flyers, and perhaps get in the newspaper or on TV again. I am retired, so my schedule is flexible. My first amendment rights are VERY important to me, so I DO go to court, and so far have won them all. which made me suspect the issue was NOT really 'obstruction' of my windshield, but perhaps the content of the message??? This is where it got very strange. Rather than just let me go on my way, to meet in court as happened previously, he asked me if I had any guns. I said, 'of course not'. Then he ordered me out of my van, and told me I had to remove the art work with 9-11-2001 NEVER FORGET, FREEDOM ISN'T FREE, and ONE NATION UNDER GOD - right here - right now, on the side of the road, 'or your vehicle will be impounded right now, and you will go to jail right now for refusing to obey a police officer's order'. This is art that I have spent many hours of work on, and spent money for the materials, and have done with love for our country. There was also a quote from Ezekiel 13:10, 'They have seduced my people, saying peace, and there was no peace'. I had missed my press conference by now, have 6 kids, have NEVER been to jail in my whole life, have not even had a point against my driver's license since about 1979... Only with the help of the Lord did I hold my own temper. I took this photo imediately before removing this art work, as ordered by this very young (and now on my prayer list) Washington DC police officer. In addition, this van was loaded TO THE CEILING at this time, so I still could not even SEE the rear window, let alone see OUT of it. This is why mirrors are requried on both sides - works for all the 18 wheelers on the road too. After removing the art from rear window, I put it on the side of the van for the rest of that day. 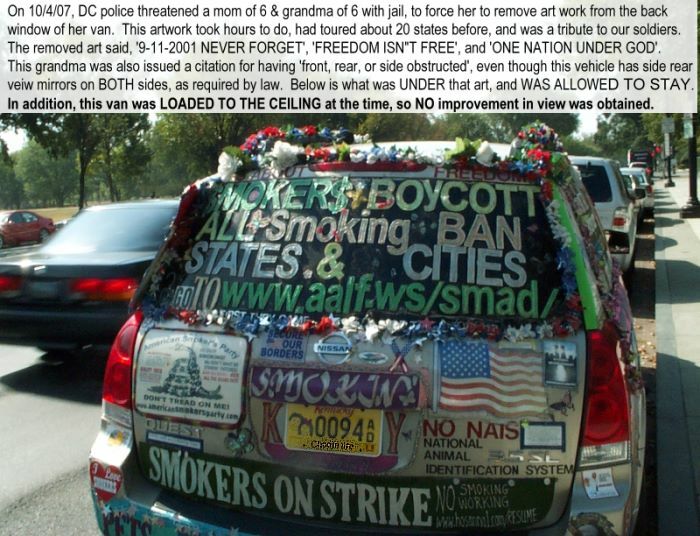 Notice, I was NOT ASKED to remove ANY of the stuff on the rear side windows about SMOKERS BOYCOTT WASHINGTON DC, etc., even though the citation said, 'obstructed front, rear, or side'. The ONLY items he forced me to remove had the word 'God' on them. This could not possibly have been about my being able to SEE, and by the way, the side rear view mirrors work just fine, I have had NO problems with that in about 70,000 miles now. I think this immature officer wanted to intimidate, humiliate, and/or provoke me into losing my temper, so he would have an excuse to impound my van, and send me to jail. It seems to me that in these days there are many real dangers to guard against, including the threat of terrorism, bombs, etc. and this is a poor use of our resources. Though it was a lot of extra work, I did replace this tribute to our troops that very evening, on the back window. He ordered me to remove it, but he did not tell me I could not put it back. I toured Washington DC for two more days, with NO further incidents. Though I got lost a couple more times, I did not dare ask any police for directions. I am now shopping for an attorney - from Arlington, preferably, as I do not want to spend any money in Washington DC. I'm not sure if I believe in suing, but I would like to sue this immature officer for harrassment, mental distress, and attempting to violate my first amendment rights. He did cause me to miss the press conference, and other activities for which I'd paid. I am praying for him, as well. I am a member of several conservative organizations, including American Center for Law and Justice. My phone number is (270)432-7272 CST. I'm a night owl.